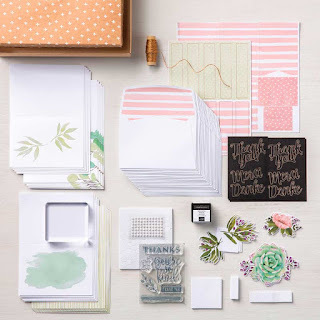 Welcome to the first Blog Hop for 2019 for the North Carolina Stampin' Up! Demonstrators! I had a chance to attend my first quarterly meeting of this group last weekend in Charlotte, NC and let me tell you - these are one talented bunch of ladies & men. It was a fun day full of stamping, meeting new friends, winning prizes and, of course, eating! Our challenge for this hop was to combine something we love from the 2018-2019 Annual Catalog and the new 2019 Occasions Catalog creating a "Perfect Pair" (direct links to these catalogs are on the side on my blog). I choose paper and sentiments from the Annual Catalog and the Butterflies and Butterfly Punch are from the Occasion Catalog. Earlier this month I had entered a card challenge and created this card using one of the most beautiful card stock in the Stampin' Up! line from the "Notes of Kindness Card Kit" (or refill). It is a note card size (smaller than A2) with beautiful shades of green that have a watercolor look. In the kit the greens are paired with pinks and together they make striking cards with very little effort. Here is the paper used for both cards and since I had the negative piece left over I didn't want it to go to waste and thought a shaker card with the new butterflies would be fun! The shaker itself was made with vellum for the base and window sheet, of course, for the window. I use both Tear & Tape Adhesive and the wonderful Foam Adhesive Strips which are just perfect for a shaker card. The butterflies were stamped with Memento Black Ink and colored in with Stampin' Write Markers, greens, blues, yellows and pinks. The layering strip under the butterflies is also from the card kit. The shaker "bits" are a combination of the Iridescent and Metallics Sequin Assortment which give an amazing sparkle. The sentiments on the card is from "Happy Birthday Gorgeous" stamp set. The butterfly on the inside was watercolored on Shimmery White Card Stock with Mango Melody reinker. Anita Trippi - You are here!